LILLE, France (AP) — ITF president David Haggerty is confident he can find a deal with the ATP to make sure their two team competitions do not clash on an already busy calendar. Speaking in France at the final of the last Davis Cup played in its traditional format, Haggerty said he had “very positive” conversations with tennis stakeholders last week after the men’s tennis tour announced the debut of the ATP Cup for January 2020, six weeks after the Davis Cup final. The announcement of the 24-team ATP Cup came after the International Tennis Federation, backed by investment group Kosmos, adopted a reform of the Davis Cup format. Haggerty said he had discussions with representatives from Kosmos — which was founded by Barcelona and Spain soccer player Gerard Pique — the Grand Slam tournaments and the ATP as well as players. A third annual team competition, the Laver Cup, was launched in 2017 and pits European players against a World team in September. For now, Haggerty is focusing on the new Davis Cup format. Beginning next year, the top team event in men’s tennis will be decided with a season-ending, 18-team tournament at a neutral site. The International Tennis Federation believes this format will be more attractive to elite players who often pass on competing for their countries because of a crowded schedule. 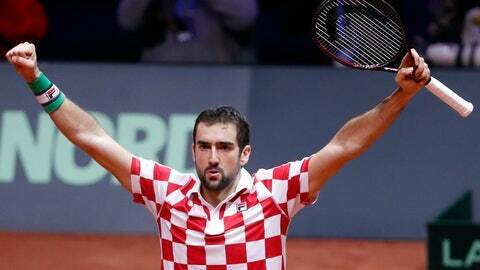 Teams will play one week in February to advance to the final in November, replacing the current Davis Cup format that is played over four weekends throughout the year. A total of 24 teams will take part in the qualifying round in home and away matches. The first edition of the revamped Davis Cup will be held next year on Nov. 18-24 on an indoor hardcourt in Madrid, Spain.